"Personally, I have come to terms with the fact that although I may never understand in this world why tragedies happen—even to the young and innocent—I have complete confidence that there is a higher purpose and plan in play." Looking back, although school violence had been occurring around the country here and there, it just didn’t seem to be a very large blip on the media’s radar screen, or in the public’s mind until the Columbine massacre. Suddenly, it was THE breaking news story across the nation and world for several months. Perhaps it was the number of victims, (13 dead, 26 wounded) or the continuous revelations related to the hateful mindset and vicious motivations of the killers on their websites and video tapes they left behind for posterity. Without doubt, it was a major wakeup call to us all that something was very wrong in our schools, and the event triggered an international debate over everything from gun-control to prescription psycho-med use in schools. Side-issues like bullying, psychological profiling of "troubled students" and school "zero-tolerance" policies were the subject of endless talk shows and print media. In the months that followed, other school violence events occurred around the nation, and even overseas. Some attacks were averted at the last minute by vigilant students who overheard unguarded comments by would-be perpetrators who were bragging about "doing another Columbine." Paranoia about school safety was nearly pandemic for nearly 29 months, until that is, the Islamic terror attack on our nation occurred on 9/11/2001. From then until now, our nation’s focus was on a "war on terror" and our incursions into Afghanistan and Iraq. 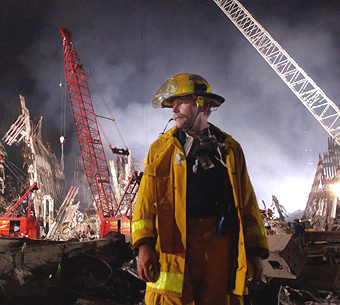 As I labored beside search and rescue workers at Ground Zero in New York City, I was asked by some FDNY guys where I was from since my turnout gear was clearly not from New York City. "Hey, isn't that where that school shooting happened?" "Columbine High School. I remembered seeing some guys in FDNY shirts standing at our memorials. I figured it was payback time and I had to come and stand with you in this tragedy." I thought to myself, "Rachel, it's all part of your "chain reaction of kindness.'" With Rachel's example driving me on, I'd respond to many more places where people hurt. It's just the right thing to do. The chain must not be broken." It has been ten years since shots were fired at Columbine, destroying the lives of twelve students and a brave teacher. Ten years have come and gone, and yet the memory of that horrible day remains for those of us who live here and experienced it. Those who were wounded and survived, and now live with the scars and disabilities inflicted upon their bodies and souls, have mostly moved on with their lives. Some are married and starting families, and others are pursuing their careers. However, all live with the memories of that dark spring day, and were forever changed by it. Each of the lives lost that day were precious beyond comprehension. This April, as in all years previous, we will visit their graves, place flowers and memorabilia upon them, and pray for the ongoing healing of the surviving families and victims. Once again we will ponder the deep mysteries of good and evil, life and death, and our own mortality. Once again we will ask, "Why God? Why?" As one who has studied history and history’s God for many years, I come to believe that the unseen hand of Almighty God guides the course of nations and individuals. Personally, I have come to terms with the fact that although I may never understand in this world why tragedies happen—even to the young and innocent—I have complete confidence that there is a higher purpose and plan in play. In the larger scheme of things, a greater good will emerge—like the mythical Phoenix bird—from the flaming ashes of tragedy, and we will one day marvel at the wisdom of God in all things. Until that bright day of understanding, we labor to preserve and cultivate what remains of goodness in the world. Jesus said we are the "salt of the world." I understand this to mean that one of our functions in this present world is to preserve what remains of goodness, mercy, love, and truth from the corrupting influence of mankind’s fallen state. Salt does not bring dead things to life, it only seasons and preserves them. One bright light in Columbine’s darkness was Rachel Joy Scott. I speak of her particularly, not because she was more precious than any other person who died there, but because she was a Christian who tried to sprinkle "salt" into her school and the people around her. Other victims did also, but I am more familiar with Rachel since I was honored to be a minister to part of her immediate family. She was known as one who tried to push back against the prevailing tide of license and immorality in her generation. She tried to make her faith in Jesus known to her friends and schoolmates through many well-documented acts of kindness and compassion. She was a friend to the friendless, a comforter to brokenhearted, and an influencer toward goodness. This drew secret admiration from the timid, and the vicious hatred of her murderers. A "thermostat person" influences their environment. The thermostat on the wall of your home "sets" the heating and cooling system and determines what the temperature will be. A "thermometer person," on the other hand, merely reflects or reveals their environment and is influenced by it. There is a vast difference between the two. "I lost all my friends at school. Now that I have begun to ‘walk my talk,’ they make fun of me. I don’t even know what I have done. I don’t really have to say anything and they turn me away… I know what they’re thinking every time I make a decision to resist temptation and follow God… They talk behind my back and call me ‘the preacher’s churchgoing girl…’ ...I have no more personal friends at school. But you know what? … I am not going to apologize for speaking the name of Jesus, I am not going to justify my faith to them, and I am not going to hide the light that God has put into me. If I have to sacrifice everything… I will. I will take it. If my friends have to become my enemies for me to be with my best friend Jesus, then that’s fine with me." 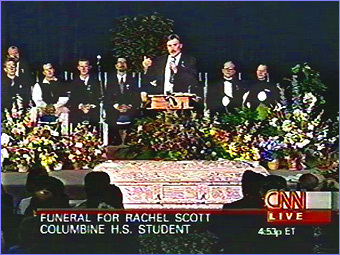 Pastor Bruce Porter delivers eulogy at Rachel Joy Scott's funeral in Littleton, CO on April 24, 1999. The funeral was reported by CNN to have had the largest number of viewers in its history exceeding that of Princess Diana and Mother Teresa. Rachel’s thermostatic influence—her ‘set point’ that touched and moved the world around her—was increased exponentially when her persecutors pulled the trigger on the bullet that took her life. Even at the last moment, lying on the ground crying with three gunshot wounds, she answered her killer’s sneering, vicious taunts with courage. She affirmed one last time her undying faith in Christ, and her words and life-example reached the entire world! In the past ten years, her story and testimony has been shared before millions of people around the world, and HER thermostat setting of love, compassion, faith, and uncompromised devotion to Jesus has influenced hundreds of thousands of young people to follow her example and receive the grace of God in Christ. "Rachel carried a torch—a torch of truth, a torch of compassion, a torch of love, a torch of the good news of Jesus Christ her Lord, whom she was not ashamed of, even in her hour of death. …The torch has fallen from Rachel’s hand. Who will pick it up again? Who will pick up the torch again?" That torch represents a life lived as a "thermostat" and symbolizes a life lived for the highest purpose of making the love of God known to all. Will you live your life as a thermostat, or will you cower in fear and timidity trying to simply conform to the world around you? The choice is yours! Take up your torch! YOU set the standard to those around you, and don’t let the world impose its standards upon YOU! "Don’t let your character get camouflaged with your environment. Find who you are and let it stay in its true colors." Bruce R. Porter, DDiv., is an author, chaplain, writer, speaker, and a pastor in the Littleton area. At the time of the Columbine massacre, he was pastor to Rachel Joy Scott’s mother and stepfather, and ministered intensely to the family during the months following her death, and officiated at Rachel’s funeral. 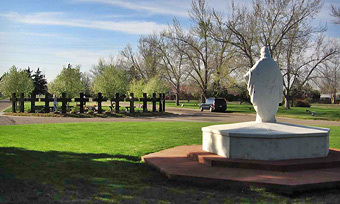 In the years since Columbine, Bruce has ministered at numerous other scenes of tragedy, including New York City after the 9/11 terror attacks, the school shootings at Bailey, Colorado, Red Lake Reservation in Minnesota, the Amish school massacre, Erfurt, Germany, Beslan, Russia, to name a few. He continues to respond to crisis situations as able.